Nikko AM was the first Japanese Asset Manager to be a signatory the UN Women’s Empowerment Principles. The Firm provides for a strong support system for women, which includes the use of flex time, careful consideration of career moves, a Women's support group, in both Japan and the international offices. Employees support a global cause, while complementing this with existing local outreach and charities which focus on similar causes. Nikko AM is focused on one centralised organisation as its global cause, and has formed a partnership with Japan for UNHCR, a national partner of the United Nations High Commissioner for Refugees. Nikko AM employees are able to make donations to Japan for UNHCR on the company intranet. There are many local charitable support initiatives, which the Firm strongly encourages. They have an overarching theme (children/children and education) but will be selected by local employees. In Japan, the three chosen charities for 2017/2018 are Wheelchairs for Children Living Overseas, Fair Start Support (supporting children leaving welfare institutions) and Mirai No Mori (providing English language lessons and outdoor programmes to children in welfare institutions). Our role as an asset manager is not only to seek improvements in the governance of the firms in which we invest but to continuously ensure that our own governance is at a world-class level. Our activities in this area, which are described below, stem from our conviction that the three pillars of governance are management governance, voting rights governance, and fund governance. We position our governance activities among the most important of our corporate activities, and all of our efforts in regard to voting rights governance and fund governance—as well as the obvious example of management governance—are directly reported on to our Board of Directors. Furthermore, based on our conviction that the best governance can only be achieved with scrutiny from outside, we strive to maintain independent oversight by ensuring that our Board of Directors is chaired by an independent, outside director, and by appointing even more outside directors to our Board of Directors than the number required of listed firms. We also ensure strict independence in the governance of our voting rights activities and funds by entrusting it to committees that not only consist of a majority of outside members but have their chairs appointed from among those outside members. As befits a firm entrusted with managing the assets of customers, our business operations are presided over by a senior management team that is well versed in asset management. Our approach to securing management talent is predicated on our strong belief that having such a team in place gives Nikko AM the strongest possible foundations. Our appointment of Yoichiro Iwama as an outside director and Chairman of the Board of Directors in May 2018 helped to strengthen our governance by bringing in his independent perspective and extensive knowledge to benefit Nikko AM. Mr. Iwama’s participation has further invigorated our Board of Directors, enhanced the transparency of its decision-making process for important business management matters, and generated lively discussions on issues including how to enhance our asset management capabilities. By having debates and discussions based on the respective areas of experience and knowledge of our directors and outside directors, we constantly examine ways of refining our vision for the future of Nikko AM and differentiating it from competitors with a forward-looking perspective on the asset management industry as a whole. As of January 2019, Nikko AM’s Board of Directors has five independent, outside directors (including the Chairman of the Board of Directors), four of whom are pure outsiders who have no capital relationships with the company. This ensures high levels of independence and transparency in our governance relative to our industry peers. We established the Stewardship and Voting Rights Policy Oversight Committee in June 2016 as a way of improving transparency in our stewardship activities such as engaging with firms and exercising voting rights as well as strengthening our governance. 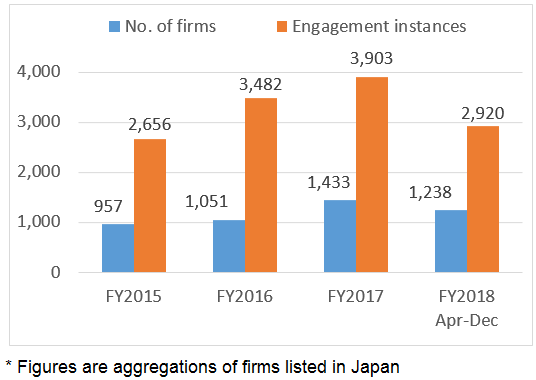 Drawing the majority of its members from outside the company, the committee is the first such third-party body to be established at a Japanese asset management company. It holds meetings once a quarter in principle and provides a venue for outside committee members to have lively discussions on how Nikko AM exercises its voting rights. The committee has held a total of 12 meetings so far. Please refer to the Appendix (PDF) for details of its activities. We established the Fund Advisory Board, whose members are also mostly from outside Nikko AM, in September 2017. The Fund Advisory Board meets every quarter in principle. The board has met a total of three times since January 2018 and its outside members participate in debates at its meetings. Please refer to the Appendix (PDF) for details of its activities. As an asset management company, our paramount mission is to be useful to our customers in their medium-to long-term asset building. Realizing this mission is not just a case of delivering strong investment management outcomes, however. We also need to put a great deal of effort into every aspect of our services, including understandably and simply imparting accurate knowledge of investment management and the products we offer, proactively delivering timely and appropriate information on market trends from a neutral standpoint to help customers make investment decisions, providing products that are suitable for medium-to long-term investment that serves customer needs, and helping customers to manage risks. Our initiatives in this area, together with the results we have delivered to date, are detailed below. We deliver our products via channels including the sales teams of the distributors we work with and the internet. The information we provide to retail investors, as well as our efforts to supply appropriate information and training to salespeople, contribute to the final investment decisions made by individuals. The extensive framework we have in place enables us to hold 1,500 seminars for retail investors and over 5,000 training sessions for salespeople annually. We strive to contribute to the asset building of customers by providing neutral investment information. Under our Fund Academy brand, we provide fund-related knowledge and information that we judge to be essential, not only to retail investors and distributors but also to non-customers. In addition to the titles shown in the table, our website contains videos, e-learning documents, simulation tools and other such information sources. * Expected average holding period is theoretical calculated by "annual average AUM ÷ annualized redemption amount" (calculation period is year 2018). The figure is different from the actual average holding period of the investor. * Funds with very small redemption amount compared with the subscription amounts or AUM may result in longer period than the actual holding period. As an asset management company, our paramount mission is to be useful to our customers in their long-term asset building. The asset management business is one in which firms can only grow if they also grow their customers’ assets. We are therefore increasing the number of our funds that have settlement dates once or twice yearly, which are appropriate for long-term asset building. 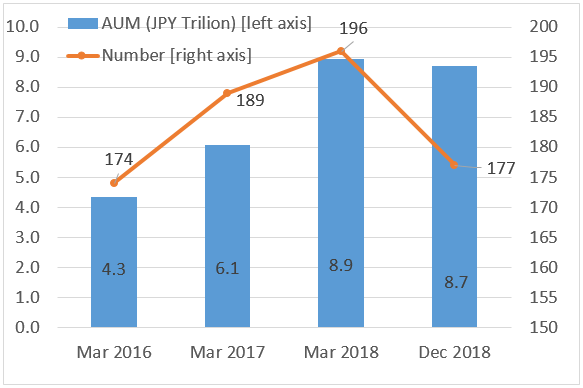 As of December 2018, such funds at Nikko AM had a total AUM of about JPY 8.7 trillion. 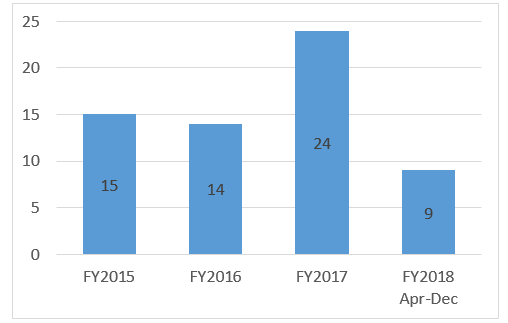 When comparing March 2018 and December 2018, while the number of funds whose settlements is not more than twice a year is decreasing, total AUM is almost flat, demonstrating gradual enhancement in efficiency of our funds. Our efforts to meet cumulative investment needs are not just confined to cumulative NISA, however, as we are also working to promote the use of defined contribution plans, individual-type defined contribution pension plans and general account for such purposes. With these products, we are advocating long-term, cumulative and diversified investments to those who wish to build up their assets. We also provide assistance to distributors for cumulative investment initiatives by not only providing products but also creating and offering a variety of support tools. Having completed the registration of one of our funds for eligibility in the cumulative NISA system, we are now preparing to obtain the same registration for multiple Exchange Traded Fund (“ETF”) products. We also held a “Product Strategy Seminar” for distributors in July 2018, at which we emphasized the effectiveness of cumulative investment in enhancing returns for investors. We consider our investment division as a team of professionals in which fund managers and analysts forge their own career paths. We also employ an appraisal/compensation structure that emphasizes medium- and long-term investment performance. This is supported by a global system we have introduced to retain key fund managers. 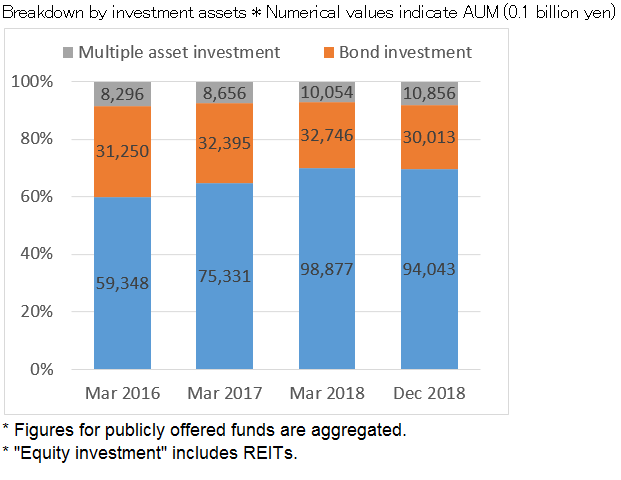 Out of the total assets in the publicly offered funds that we manage on behalf of our customers (as of December-end 2018), equity investment funds accounted for 70%, bond investment funds (including MRFs) accounted for 22%, and multiple asset investment funds/other funds accounted for 8% of the total. * Publicly offered open-end funds. 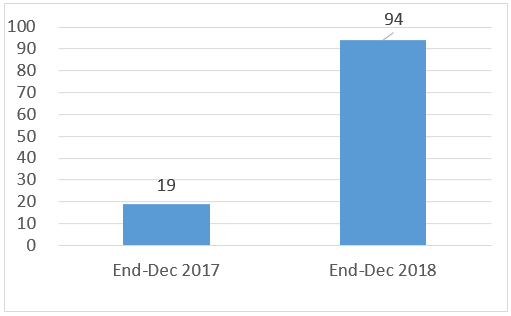 AUMs are as of end-December 2018. Funds with AUMs below JPY 10 billion are excluded. Our belief is that it is imperative for asset managers to constantly develop and manage more attractive and effective products for investors. This means that it is of paramount importance for us to create an environment in which our investment management resources—in other words, our highly capable investment managers—can fully devote their time and abilities to full-time specialization in fund management. We believe that creating such an environment helps to deliver long-term returns to investors. At the same time, there may be cases where a fund’s AUM shrinks to a level below the minimum amount required for management, making it difficult to achieve the investment management goal set at the time of its launch or raising the cost of managing the fund to a comparatively high level. This can reduce the ability of a fund to deliver the level of investment performance that customers demand even in the medium to long term. At Nikko AM, we feel it is important to have a structure in place that enables us to maintain our high-performing existing funds and secure the internal resources needed to develop and manage the new funds that our customers expect not only by terminating smaller funds when they reach maturity but by terminating them early if necessary. We carried out early terminations of 22 funds between January and December of 2018. 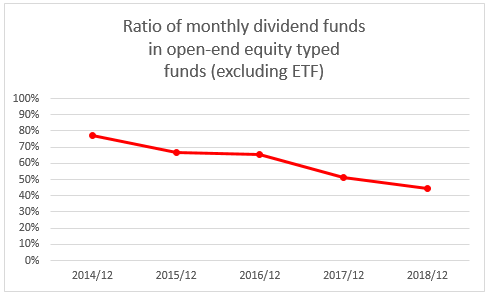 The ratio of publicly offered funds (excluding ETFs) that pay out monthly dividends is falling and stood at 45% as of December 2018. 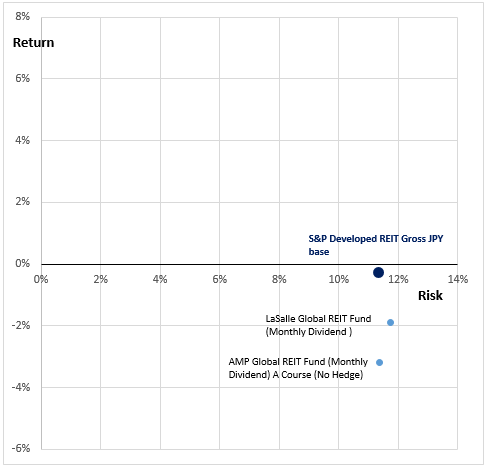 Note: For Natural Resources Equity Fund, risk-return figures for the USD course (converted to JPY), a major fund in the same strategy, were used. 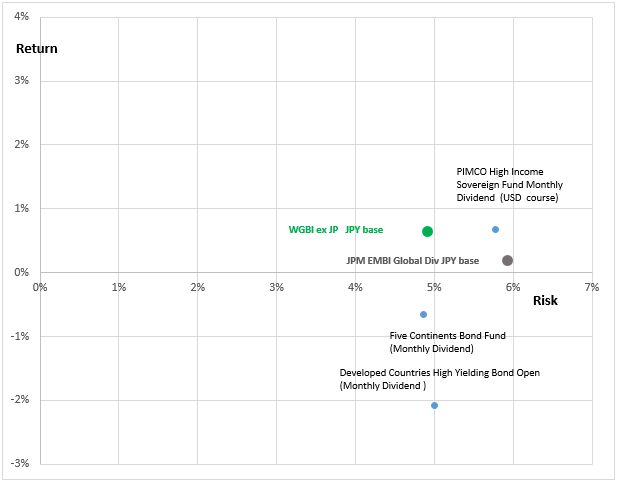 Note: For Nikko PIMCO High Income Sovereign Fund, risk-return figures for the USD course (converted to JPY), a major fund in the same strategy, were used. Note 1: LIBOR1M was used for the risk-free rate. 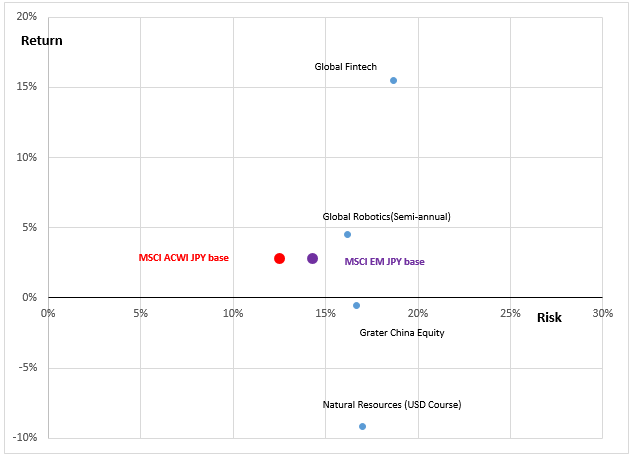 Note 2: For Natural Resources Equity Fund, risk-return figures for the USD course (converted to JPY), a major fund in the same strategy, were used. 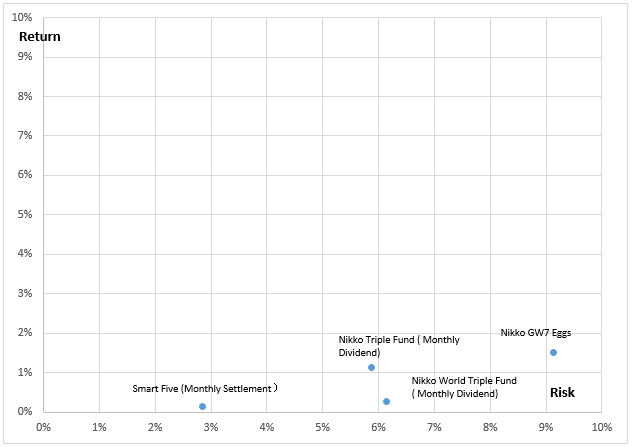 Note 3: For Nikko PIMCO High Income Sovereign Fund, risk-return figures for the USD course (converted to JPY), a major fund in the same strategy, were used. Our starting point for institutional investors is to find out our customers' needs, and to work hard to meet those needs. In our sales activities, we then propose products in line with each customer's level of risk tolerance. As a part of these efforts, in December 2017 we launched a tool and used it to start providing support to help our corporate investor customers improve their risk management. As of end-December 2018, the support tool was being used for 94 accounts. We work daily to develop products that serve the interests of our customers. 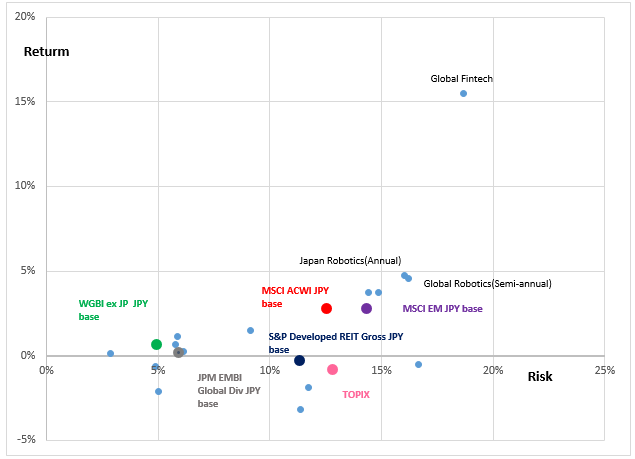 In the past year (January-December 2018), external assessment institutions have given awards to two of our Japanese equity funds, one of our Japanese bond funds, six of our foreign equity funds, four of our foreign bond funds and eight of our balanced funds, recognizing a total of 21 of our funds. * Aggregation of awards from R&I Fund Awards, Fund of the Year (Morning Star) and Lipper Fund Awards. We believe that it is one of our key responsibilities as an asset manager to help the companies in which we invest to improve the value they offer to investors by vigorously pursuing our stewardship activities including the exercise of voting rights. We constantly work to ensure that our activities are sustained and steadily improved upon. At the same time, we incorporate the concept of ESG into all of our investment management processes and perform assessments of the corporate value of firms—including their non-financial information—in order to promote medium- and long-term improvements as well as sustainable growth, and this approach is useful in our investment decision-making process. We also organized the ESG Global Steering Committee in order to further expand the global reach of our ESG efforts. Comprised of leaders in our investment management operations in Japan and overseas, the committee deliberates over matters such as ESG initiatives, ways of putting them into practice, and new approaches. Our initiatives and results to date in the above-mentioned areas are as follows. Our fund managers and analysts have always been proactively involved in engagement and proxy voting in order to help firms in which our active strategies invest improve their corporate value. We have worked since 2013 to boost the corporate value of a wide range of firms, including their ESG levels, by starting to assign CSV scores (a way of giving firms comprehensive assessments that include ESG scores). Since then we have assessed over 600 firms with a focus on helping them to achieve sustainable growth and enhance their corporate values in the medium to long term. 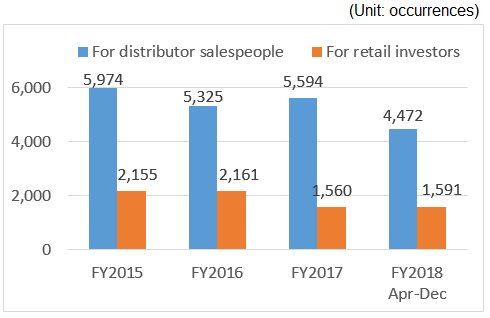 In March 2017, we launched a body devoted to activities to promote better corporate and shareholder value for Japanese names in which we invest (about 2,200 firms), including in our passive strategies. These initiatives have further improved our ability to engage with firms and exercise our voting rights in order to help maximize the corporate value of firms. In 2018 (Apr-Dec) we engaged with 1,238 firms, and in the same period the number of instances of engagement we had was 2,920. It is our responsibility as an institutional investor to help the companies we invest in to improve their value and grow sustainably through our stewardship activities, including the exercise of voting rights. In addition, we understand the importance of strengthening our own governance and increasing transparency for those outside the company. With this in mind, we established the Stewardship and Voting Rights Policy Oversight Committee in June 2016. Not only is the committee’s chairperson an outside officer, but the majority of its members are from outside Nikko AM, thus ensuring its independence. The committee holds quarterly meetings at which it decides Nikko AM’s policy for the exercise of voting rights from a neutral standpoint, monitors our exercise of voting rights as one of its oversight responsibilities, and provides other forms of guidance. Since launching the Nikko Eco Fund in 1999, which invests in environmentally friendly firms and is Japan’s first Socially Responsible Investing (“SRI”) fund, we have incorporated ESG factors in all of our investment management processes based on our understanding that they contribute to medium- and long-term corporate value. We also constantly introduce new initiatives in order to put our EGS activities into practice more effectively. Since August 2013, we have been applying the principle of Creating Shared Value (“CSV”; the practice of creating value for society and firms by aligning efforts to solve societal issues with corporate interests and pursuing both goals simultaneously) by having our analysts formulate unique CSV scores that incorporate comprehensive assessments of firms’ financial standings, market competitiveness levels and ESG initiatives, and use them in their stock selections. 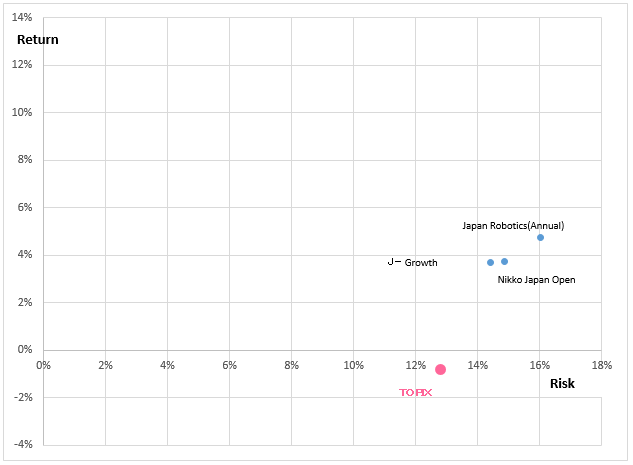 We currently formulate scores for 600 stocks listed on the Tokyo Stock Exchange from a medium- to long-term perspective. We have already built up a track record of over five years of assessment and engagement based on our analysts’ close engagement with the 600 firms whose CSV scores we assess and their daily work to improve corporate value including ESG. Our other initiatives are as described below. * AUMs are as of end-December 2017. * Open-end, publicly offered funds. We have been a signatory to the United Nations’ Principles for Responsible Investment (PRI) since 2007. Our pioneering approach as an investment manager demonstrates our commitment to contributing to medium- and long-term corporate value and sustainable responsible investment. Our overall PRI approach has been awarded the top assessment level (A+) for the past three straight years (out of six levels from A+ to E). Since launching a body specializing in this area in March 2013, we have expanded the number of firms whose ESG we research from the previous number of about 950 (active strategy investment universes) to 2,000 by adding firms in which our passive strategies invest to the scope of our research. Engagement regarding fiduciary principles and ESG principles are continuous efforts that will never come to an end, and all officers and employees at Nikko AM will continue making their utmost efforts to put the principles into practice. We will continually provide updates on those efforts. Furthermore, we intend to take our role a step further by switching the focus of our role in fulfilling our fiduciary duties from protecting the interests of customers to promoting the interests of customers. Click through to visit our site dedicated to our ESG commitments.